Varsity Termite and Pest Control have ten more entomology terms for you. Again, most of the terms are related to termites. Each terminology hints towards the behavior and biology of termites and related pest. Social insect [ so-shall in-sekt ] n.
This term basically is the society behavior of the insects. Each colony exhibits division of labour. Insects are divided into different types of classes. A group will stay within the habitat and take care of it, another group will go out and hunt for food, and another group will reproduce. Insects have a society with order, each class has a job to do. Stomodeal [ stO-mO-D-al ] adj. Stomodeal is mouth to month feeding. It’s similar to bird feeding. When the baby bird is born, the mama bird will feed baby mouth to mouth. Apparently, termites do a similar feeding. The soliciting termite caresses the head of the hungry termites with its antenna or taps it mouth with it mandibles. That will proke a droplet of food which is then consumed. No wonder termites are very close when the colony is discovered. Strip shielding is a physical termite barrier which typically passes horizontally completely through a building element. This will happen when termites are literally eating through the building element. Let’s say a concrete stump that is right outside your house and it has termites. There is a mud tunnel that goes from the ground to the ceiling. When it was expanding, you thought is was dirt piling up. While you discarded the mud tunnel, the termites were eating right through the stump. Time passes by, the spot where the mud tunnel was, a crack is now on its place. Whenever you spot a mud tunnel, anywhere, call a termite pest control company. Having a termite inspection in North Phoenix will prevent a damage to become severe. Subterranean [ sub-tur-A-knee-ann ] adj. & n.
Subterranean means having a connection with below ground activity. Most termite nests originate from the ground. We guarantee that if you spot a mud tunnel, follow it, it will lead you to a subterranean nest. If the mud tunnels are on the exterior foundation of your house, the tunnels might go right through the ground. If the mud tunnels are in the interior foundation of the your house, the subterranean nest might be on the floor, or below the floor. Again, if you spot mud tunnels, the width size of a pencil, call a termite control company in North Phoenix. Termitarium [ tur-mitt-air-ee-um ] n.
Termitarium is a large multi-chambered nest. Termitarium contain structures which stores food, water, and ameliorate the physical environment. Hopefully you don’t have one in your backyard. Termitarium are usually seen in in the wild. If there is a termitarium in your backyard, you have an enormous problem. Termiticide [ tur-mit-tih-side ] n.
Termiticide is a substance that is used to kill termites. It’s a specific insecticide that targets termites. When an exterminator is conducting a termite inspection, he/she is analysing what stage of metamorphosis and where the termites are located to determine what kind of termiticide is needed. There are termiticide that is targeted to a specific stage of metamorphosis and where the termites are inhabited. 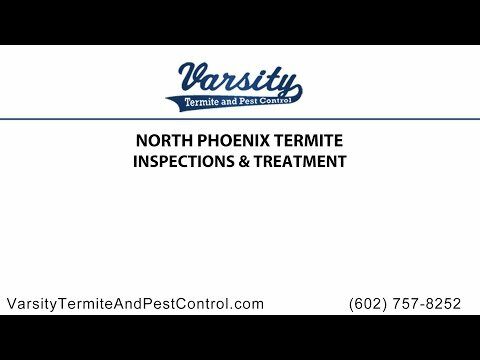 If the termite treatment in North Phoenix is unsuccessful, it probably because the treatment was improperly determined. Termitophile [ tur-mit-oh-file ] n.
Termitophiles are animals that live within the nest and gallery systems of termites. There are other small critters that invade the homes of termites, who knew! Beetles, flies and wasps are the popular termitophiles. Termitophile are commonly predators or feeding on the production of the termites. This tells you that having a termite inspection by an expert is a must. There is a chance that other pest are invading your property. Truncate [ trun-kate ] adj. Truncate is something that is shorten, cut off or squared at the end. A truncate trail of ants is very common made by a leaf, other small critter, or human. Xylem [ Zy-lemm ] n.
Xylem is found within the woody tissue of plants. It’s the best friend of cellulose and lignin. Whenever looking at the tissue of plants through a microscope try to identify the cellulose, lignin, and xylem. Learn why termites are very attracted to it. Xylophage [ Zy-low-faje ] n.
Xylophage is a creature that feeds on woody plant tissues. Termites are considered a xylophage. Termites will literally destroy everything in there path to get woody tissues within their teeth. Considering we are in Arizona, there aren’t a lot of trees around. We mostly have cacti. However, most plants of similar biology, which mean cellulose, lignin and xylem is very likely to be found on other desert plants. This the end of our emotomoly lecture. Most of the terms that we taught you are related to termites. There are also other pest and organisms that may damage your property. Pest are likely to create pathogens and pathogens are likely to attract more pest. Varsity Termite and Pest Control have exterminators that are well trained and certified to handle any case of termites, scorpions, pests and pathogens. Explore our website or call us, we’ll be happy to help.